Good location and only a few minutes down from the railway station. The team was well prepared - I was late arriving and my key and room was ready for me. Good wifi. My room was perfectly fine, quiet, warm and clean. Perhaps a little basic for the pricing, but this is Switzerland! Good view from a terrace. Decent breakfast. Reasonable/standard ensuite. Other rooms may have had better views than mine. Excellent location in town and close to train station. Breakfast was very good. Amazing view and prefect location. 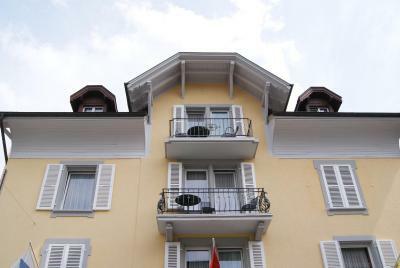 Close to lake and to the Spiez train station. Location is convenient. It’s between train station and pier. Room with lake view. It's include breakfast. Close to train station. very good small hotel, the boss and staff are nice, breakfast is good too. clean and quite. The dining room was delightful. The breakfast was Spartan. The hotel is about 15 minutes walk to the lack. They have a small lift to go up stairs. We had a room with large balcony outside the window. The view to the lack was splendid. The hotel staff was friendly and gave us plenty of information. The breakfast was nice as well. Wake up to fabulous views of a fairy-tale castle, a lovely lake and magnificent mountains. At the Hotel Bellevue, your vacation home away from home, you can leave the stress of everyday life behind and take time out for yourself. Hotel Bellevue is situated on a quiet side street, where there are several businesses including a bakery, a newsstand, photography shop, hairdresser and bank. All non-smoking rooms. They feature village or lake views and some feature a terrace, as well. The hotel is placed very nicely. The view from the balcon is really awesome! And the only staff member I saw was doing a pretty good job. They gave us also voucher for different attractions in the region - those where very helpfull. The location was great, it was just a short walk from the train station and there was a beautiful view of the lake from our room. The room had 2 windows so it was lovely and bright and in the shower room there was natural light from a Velux window. Breakfast same and I had the last croissant on many occasions. Choice quite limited. But ok for a few days. Breathtaking views. Attention to detail.provided an adaptor as Swiss plugs are not European standard. Ideal for railway station. 5 minutes walk.fruit fish on arrival.helpful and friendly staff. Very comfortable and great views!!! Basic and comfy accommodation with good view from the terrace. Good and simple breakfast. Late arriving but all information and key to the room was ready at the front. A bit old furniture and style, but made well. Nice and very friendly host, beautiful view from the window and balcony.